The Cubists were not spontaneous products, know-nothings, trying to cover up their ignorance. They had behind them twelve years or so of experience in their art before they appeared, determined to question everything - form and colour. Their masters had been the Impressionists, the Pointillists and others again among those whom I have mentioned, who had received and who had developed the lesson of Delacroix. Certainly, they still admired them, but this admiration was not without reservations, the most important of which touched precisely on the way in which they had understood drawing. And that is why, still seeing nothing other than the classical, the Cubists gave their own mode of drawing that angular and polyhedric character which caused such a scandal but which, at bottom, had only been done with a view to emphasising the principles on which it was based. The scandal was all the greater because this emphasis had required the artist to use exclusively greyish tones, to the detriment of those coloured seductions which were beginning at the time to enchant the surrounding world. The first manifestations of Cubism were, then, done more with a view towards restoration than with any desire for revolution . 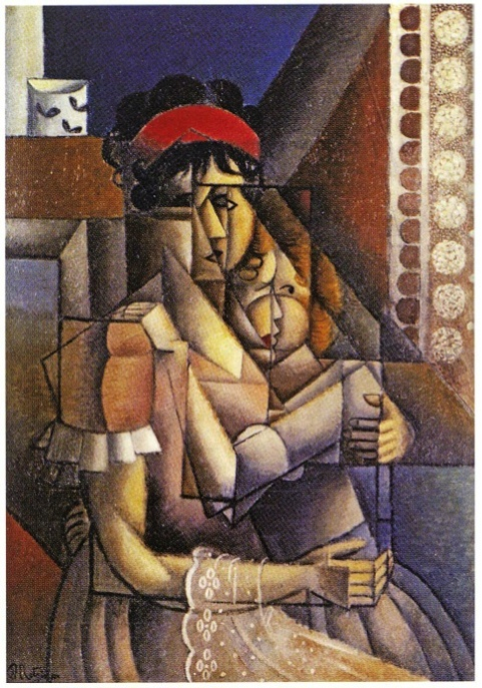 The name 'Cubism' suits these efforts perfectly well - cube, volume, the three dimensional extension of perspective, the representation on a plane surface of objects and spectacles that are conditioned by these figures and by this space; it is the subject of the Renaissance, with its laws stated explicitly. The appearances caused anger; their rigour and their austerity shocked a careless world for which painting was a sort of dilettantism. With the passing of the years - I say what I think, though I know I am both judge and plaintiff - one can see how modest our ambitions were at that time. Doctrinaire though they may have been, they demanded no more than a little solidity in a kind of drawing that was still conformist, still faithful to the idea of drawing that was accepted by everyone without discussion. Happily for the future of Cubism, it didn't stop there. From volume, it passed on to the subject itself. It asked what the reality of that subject was worth, when it was seen only from the single point of view allowed by the perspective mechanism. It thought that this subject could be greatly enhanced by multiplying the perspective points. And that is really the moment at which it joined up again with Cezanne. The 'total image' which we talked about at that time could not be attained by such a small step, but this was still, already, an unacceptable deviation from that much-vaunted progress in human knowledge, the perspective unity of the subject. (8) We were made to know it, to the extent that questions were raised about us in the Chamber of Deputies and the Municipal Council of Paris. However, in spite of our failure to achieve the end proposed (the 'total image'), the multiplication of perspective points was not an experiment without profit or without a future. Indeed, it gave us the idea that - contrary to the formula adopted without discussion, which situated painting only in space and, consequently, declared it to be a static art - it could perhaps be less opposed, less alien than we had thought, to time , that is to say, to a certain movement. This idea was the logical deduction to be derived from that succession of points of view which had been brought about through the rejection of perspective unity, a perspective unity which only allows the subject to be seen from a single point of view. (8) In fact, in its own nature, the eye is only capable of seizing the flat surface. The idea of volume is passed on to it by the intellect which, in turn, has derived it, not from the sense of touch, but from a process of muscular prehension. As far as the eye is concerned, it is just a simple matter of adapting itself to a knowledge that has come from another source. At this moment, Cubism no longer corresponded to the name that had been appropriate for the earlier works. It was still classical by virtue of the position adopted in relation to the subject, to the spectacle which was still treated as if it were a plastic, objective reality. But, since it had attacked the foundations of this Classicism by rejecting the orthodoxy of the single point of view, it began to hint at heresy and its Classicism became quite inconsistent. It is always the first step that is difficult; once that is accomplished, the others become easier. We may say that it was this step that was bound, inevitably, to produce a complete modification of the humanist idea of drawing - the painter drawing an external image - and to restore to drawing its living character, that of the painter drawing according to his own resemblance, traditional drawing. The harmony of lines and their arabesque, as autonomous realities in their own right, were becoming more than just an ideal that could be imagined. They were becoming possible, and this harmony was to achieve its full development in cadences and counterpoint and, eventually, to enter into unison with the same harmony, the same cadences and counterpoint in the colour. When it was possible to achieve this, it would be possible to achieve the 'total image', which is really painting as an object in itself. The craft of the painter would be restored in its rules, based on the nature of Man, not of a man stopped in front of an external appearance, but of a man in act, incarnating the quality of his own reality in the reality of his work. It is not my intention to describe all the different particular paths that followed from the adoption of plural perspective. 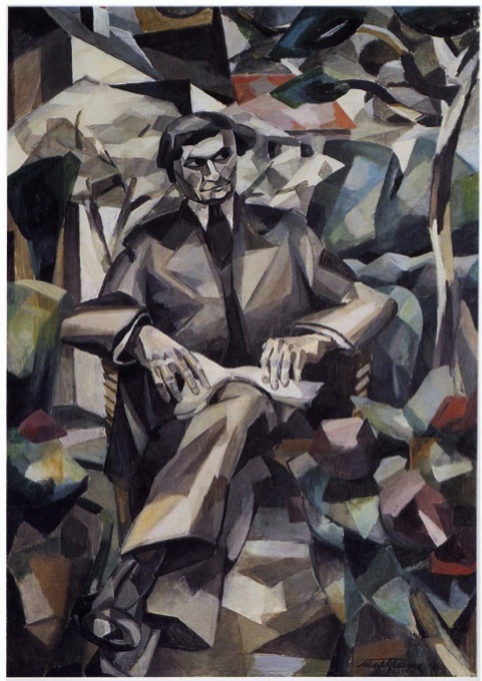 That would oblige me to consider each of the Cubist painters in the light of his own personality, his tastes, and to invoke the more or less original manner he developed to take advantage of this shattering of the subject which, up to then, had been kept in a state of equilibrium by the dogma of perspective unity. Such a study would certainly be most absorbing and it certainly needs to be done, without losing sight of the starting point. But I am not going to attempt it, just to indicate the reverberations that this effort towards emancipation, which was not lightly undertaken, caused in the work of other painters. They heard it badly. What did we see? So many painters, so many varied presentations of a subject taken apart, delivered up to all sorts of fantasies and all sorts of subversions. That, on a superficial level at least, was what was provoked in the world about us by a work which, without being really methodical, had, nonetheless, been the product of a long period of reflection. A door had been opened for the worst of subjective manifestations which appeared, timidly at first but, little by little, picking up courage. It was as if a disorder which was already potentially present had only been waiting for the right moment in order to break out. That moment had now arrived because, from now onwards, the subject was no longer obliged to remain confined in a state of perfect immobility. The painter could now agitate it as he wished. He could keep certain aspects and elements that he wanted, taking only his own taste into account. Freedom had just won a victory. It was used largely to the detriment of the organic drawing. A certain pleasing coloration (a habit gained from frequenting masters of colour whose teaching, however, barely penetrated beyond the surface of the work that came after them) - was enough to cover up the poverty of the drawing and to prevent people from understanding what the real meaning of the Cubist initiative had been. It was, at the same time, the artist as subject who attributed to himself this liberty with regard to the subject - the one does not go without the other. So much so that, little by little, the painted subject began to lose those connections that had made it accessible to the 'average intelligence' and, without changing its own nature, it began to adopt spatial shapes that only served to reduce its pictorial possibilities - the square, the triangle, the circle, and, finally, as a sign of even greater liberty, the deformed figures of the square, the triangle and the circle. Who, possessing even the smallest degree of perspicacity, could fail to see the persistence of the classical subject in these unquestionable representations of a subjectivism that no longer feels any need to account to anyone other than itself? Persistence of the subject in its spirit, a spirit that is infinitely more serious than the letter, because it is more apt to nourish disorder through the consequences which, inevitably, it provokes. In fact, for the many painters who have, in all sincerity, got themselves stuck in this cul de sac, and for the greater number of people for whom the mysterious effects of line and colour are nothing, the fact that they cannot discern the subject under a recognisable form is enough to persuade them that the subject no longer exists. Nothing could be less true, and what proves it is the flood of facile literature that is poured out over these works: to subjectivism is added subjectivism multiplied. The error is even more obvious when it is said that these works exist beyond reality. But what do these people mean when they say 'real'? The grandiose representations of the Renaissance and what came after them? We have already explained why these spectacles are the very reverse of real. So, we have to conclude that the state of mind that gave rise to them, the state of mind of Humanism, has not been subjected to any very careful criticism. It has been taken as valid currency and, by virtue of the process of the dissolution of the subject which we have already indicated, when that same humanist state of mind no longer evokes any reminiscence of what we perceive by means of the senses, we imagine that it has gone beyond the real. But it is the reverse that has taken place, the fall into the abyss. If we wish to go beyond the real, we cannot start off on the basis of a misapprehension as to what it is.